Highly recommended for motorcycles with minimal body panel structure and/or catalytic converts in mufflers, including many KTM models, such as KTM 950 SE, KTM 990 Adventure, KTM EXC models, etc. 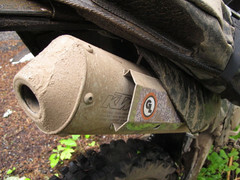 Modern motorcycle exhaust systems can produce incredibly high temperatures – up to 1200°F (650°C)! At these temperatures, few materials can withstand DIRECT CONTACT (touching) without breaking down. Yet, even a fraction of an inch of air flow is sufficient to prevent damage to side panels, luggage and other materials. By properly installing one or more Hot Springs Heat Shields, you can enjoy years of trouble-free riding in even the most extreme conditions.